You will find what your looking for here. The compact Series 32B Temperature/Process Controller offers advanced control features for temperature or process applications. Enclosed in a 1/32 DIN housing, the Series 32B is designed with dual, 4-digit LED displays. Monitor and control temperature or process applications using the Series 16B controllers. The units offer two separate outputs for dual loop control in direct or reverse acting. Select relay, voltage, or current output combined with a second relay output. The Series 4B 1/4 DIN Temperature/Process Controller is designed to accept thermocouple, RTD, current or voltage input and provide dual outputs for control. Outputs include relay/relay, voltage pulse/relay, current/relay, or linear voltage/relay. Series 16C Temperature Controller offers temperature measurement and control in a 1/16 DIN package. For direct or reverse acting (cooling or heating) control, Series 16C can be programmed for simple ON/OFF or more complex PID control functions. The Series 8C can be programmed for simple ON/OFF or PID control functions. PID control is supported with manual or auto-tuning. Select relay, voltage pulse, or current output control. The controller also includes two additional alarm outputs. The Series 4C can be programmed for simple ON/OFF or PID control functions. PID control is supported with manual or auto-tuning. Select relay, voltage pulse, or current output control. The controller also includes two additional alarm outputs. The Model 32DZ temperature/process controls is a 1/32 DIN power, flexibility, and value. 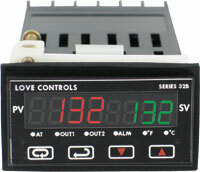 Dwyer/Love Controls is proud to be the creator of the world™s first dual zone control in the 1/32 DIN size. Designed and built in the USA!